It's that time of the year, time to get back to work, and look ahead. The business has been closed for 2 months - not much of that time would qualify as a holiday, but I really need to think about puzzles again. And actually write them! 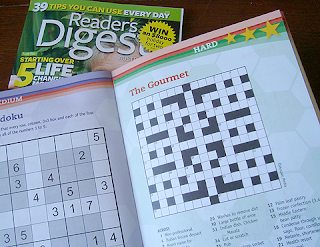 The year's started well - at the supermarket checkout I noticed Readers Digest has a 'FREE Holiday Puzzle Book' with the January 2010 issue. It was a great surprise to discover it contains three of my puzzles! The Gourmet crosswords are mine (copyright notice is to my syndicator, Auspac Media, which is normal in this business). Australian/New Zealand editions only, sorry to my American buddies. I was wondering what's happening with the "Activity Mania" book I did for Hinkler Books last year ... I haven't heard anything since last May, when it's publication date got pushed back to March 2010. Lo and behold, today I discovered there's a cover up on their web site. This is the first 'finished' part of the book I've seen to date! This book was more of an art direction job, in many ways – I planned the content for each page of puzzles and activities, provided a massive database of images to be used as sticker images and photo reference for the illustrators, wrote the puzzles with introductory text, and so on. All the illustration is done by Hinkler Book's talented artists, and Hinkler does all the layout too. There are four sections of the book (so it can also be split into four smaller themed books) - On the Farm, Things that Go, Animals, and At the Beach. It will be out in Australia, the USA, Canada, UK, and NZ, I think. Most English-speaking countries, anyway. I had to write all the puzzles so they would work for kids in the USA, Australia, and UK, which limited the vocabulary somewhat (eg I couldn't use the word pants to define trousers, because pants = undies in the UK - and so on). ETA : In answer to several people - yes, my puzzles can be sold repeatedly, which is the beauty of syndication. For example, my 'Quick Break' crosswords were published in a Queensland newspaper for a long time, but they've recently cancelled their subscription. I have around 150 of these puzzles in stock - another paper - The Cairns Post - has now picked up this crossword series, printing just one a week, starting with Quick Break #1, so I don't have to write any more of these puzzles until they're getting close to the end of the stock, which will take a couple of years! One newspaper may purchase "First state rights" to one series of puzzles I write, which means any other papers in the same state (eg Queensland, or Victoria, or wherever) would have to wait before they printed copies of the same puzzle. There are all sorts of different rights (local area rights, first state rights, etc). What I earn depends on the level of rights, and also distribution - so a small local paper may only pay $20 to print one of my puzzles, but a major metropolitan paper might pay more like $120 for the same puzzle. So you can see why I'd like to get into the major metropolitans! 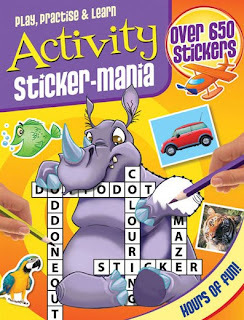 oohhhh, going to have to keep my eye out for the Activity sticker-mania book for the kids! Sirius 'helps' us do the Age weekend crosswords. Well, we are cuddled up in bed with cups of tea, which means that her presence is necessary. Pretty bad at getting the relevant reference books though. Stickers!! Always a favourite here too. Glad you feel up to working, you must be mending!! Poor Petal, Chihuahua puppy labour, I see!! Too much thinking will do that to a pup!! Oh, what fun! The activity book looks marvelous. And finding your puzzles in books - do you get a bigger pay check when they re-use your work? Petal is too utterly adorable. I'm back to work today too - well I worked from home a bit but not too hard. Re-entry is a pain in the arse! 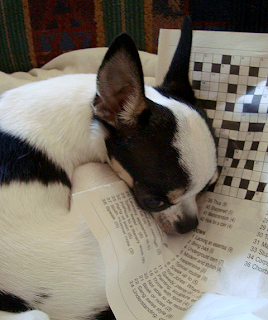 Teehee, Petal needs some crossword help! It's good to be back to work. I thought the opening of this yr would be slow, but it's proving to be the opposite. So glad that you are better and back to working. I have been off line for so long it seems! Great to see so much of your work. I absolutely love it when you post about your work. I think you have the coolest and most unusual job of anyone I know. I am so glad you're on the mend and back at work. That hard work has paid off, congratulations. I was wondering, too, if you get paid for the times when your puzzles are used in other publications. You should! It sounds like you're able to concentrate so the pain level must be diminishing? ooh wow! That activity book looks FUN! Guess what all the kids I know are getting as pressies this year?! Doesn't it feel great to see real-world things with your work? Congratulations!